Brian Thacker Travel Writer | Monkeys and scorpions and snakes. Oh my. 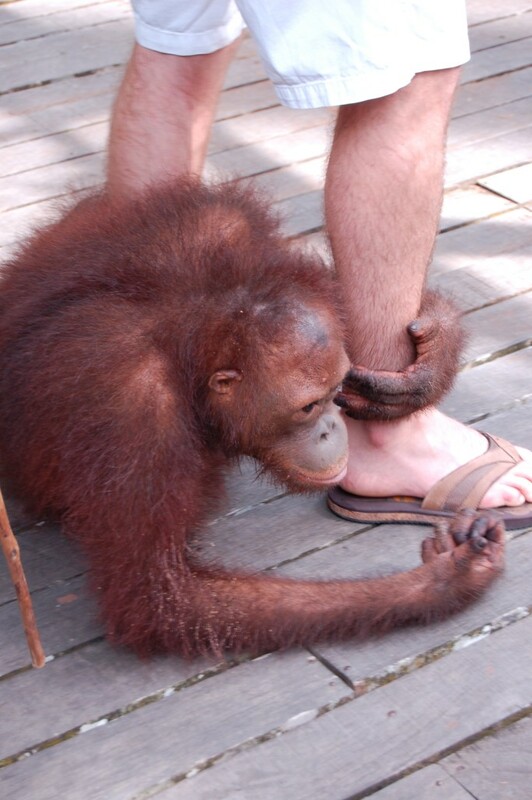 On the five hour bus trip to Sepilok it’s very obvious to see why the orangutans in Borneo are endangered. For over two hours we drove past endless rows of palm trees that had replaced rainforest. That’s over 200 kilometres of the orangutans’ natural habitat that had been wiped out for palm oil production. 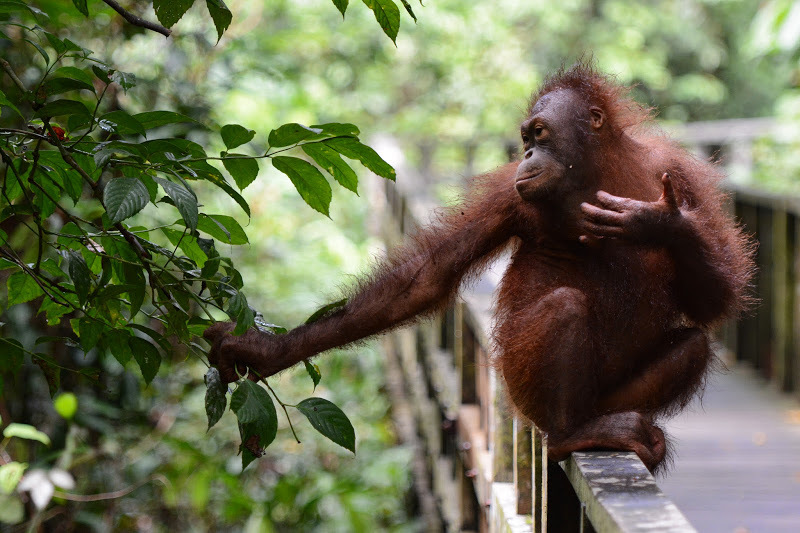 This has helped push orangutans to the brink of extinction, which is why the Sepilok Orangutan Rehabilitation Centre was set up to rescue orphaned baby orangutans from logging sites and plantations. 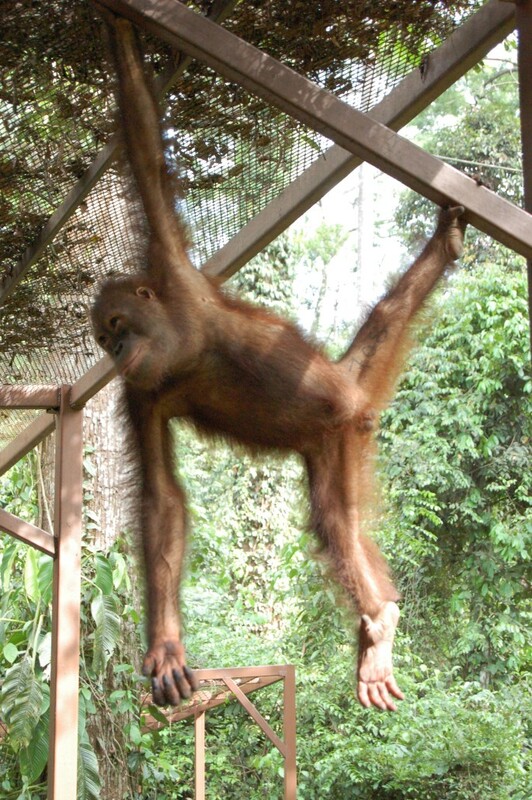 More than 600 orphaned orangutans have passed through the 43sq km sanctuary since it opened in 1964. We were staying at the Sepilok Jungle Resort, which was only a five minute walk from the entrance to the sanctuary. Our orange cousins (we have 97% of DNA in common) are fed twice a day from a feeding platform, which is a ten minute walk into the park along a wooden walkway through the jungle. On our first visit for the morning feed the viewing area was packed with tourists, including a troop of annoying folk on a photography tour with one metre long lenses and total disregard to everyone else’s space. Only two came out to feed (that’s the orangutans, not the annoying photographers), but when we returned in the afternoon, with about a quarter of the crowd, we got quite the show. A cheeky 8 year-old fellow jumped up on to the viewing area and proceeded to hug people’s legs, then swung above us stopping briefly to drop a big poo that just missed Jasmine. Now that’s getting close to nature. A friend suggested that we do the Sepilok Night Tour on our last night. That was because after you do the night tour you will never want to go into the jungle ever again. The place is teeming with dangerous and scary critters. We had our very own tour guide because there was only me and Jasmine on the tour. Which sounds nice, but it just meant all the things that wanted to kill or eat us only had two to choose from. 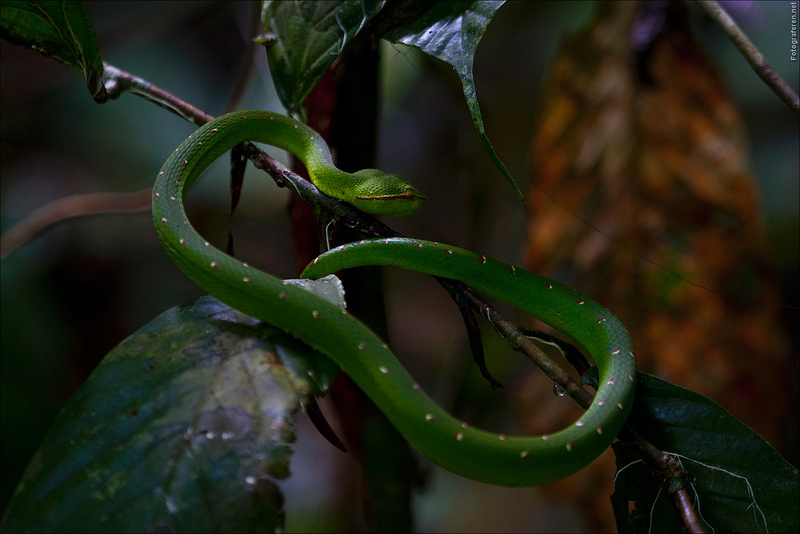 With torches in hand we entered the dark jungle along the wooden walkways and within minutes had spotted our first potential killer hanging in a tree: a very poisonous viper snake. ‘There are lots of vipers here,’ our guide reassured us. 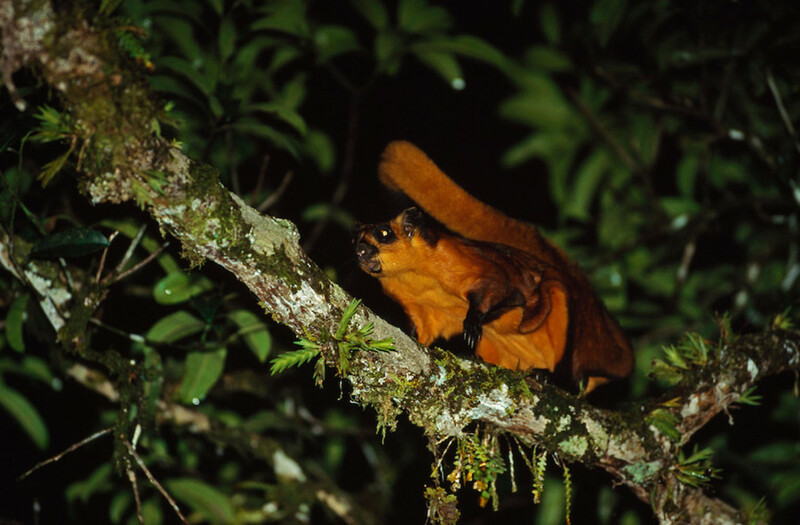 At least the giant flying squirrels had no interest in biting, eating or poisoning us. Our guide knew exactly when they would start flying between the trees (they can glide for 50 metres). ‘They will start at 6.33,’ he said. That was sunset time and that was when it was dark enough for them to dodge the giant flying eagles who like to snack on giant flying squirrels. Their flights were delayed, however, because waiting in the departure lounge (or in the tree behind us) was an eagle-eyed eagle. Then, when it was almost dark, they flew above us between the trees. And best of all, they didn’t try and poo on us once. Now I don’t really suffer much from arachnophobia and I can happily pick up a spider from the bathroom wall at home and put it out in the garden, but what we saw on our night tour was like something from a horror movie. Our guide pointed his torch at a seemingly random tree and the whole trunk lit up with hundreds of glowing little eyes. Eyes that belonged to hundreds of not-so-little spiders. It didn’t matter that they were not poisonous, the sheer number of them (and those eerie glowing eyes) was enough to make us walk very fast past the tree. And Jasmine’s face looked just like someone’s face in a horror movie who is about to be attacked by a spider the size of a car. Okay, now it was getting silly. And if I’d known this earlier in the tour I would have run for the hills – or at least to the safety of our room. Towards the end of our night tour our guide grabbed a small twig and gently poked it next to the top of a post on the handrail of the wooden walkway. 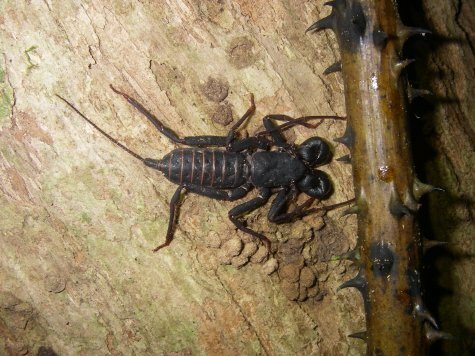 As he did a black scorpion scuttled out from the gap between the post and the rail and tried to grab the twig with its menacing looking pinchers. He then did it on the very next post and the same thing happened. And the next. And the next. For over an hour we had been walking along constantly touching the handrail where, on every single post, lived a scorpion. And a few times earlier that day I had been sitting on the handrails. What freaked me out was he told us that scorpions loved cracks to hide in and here I was offering up a nice big warm crack! I have not laughed so much in ages. 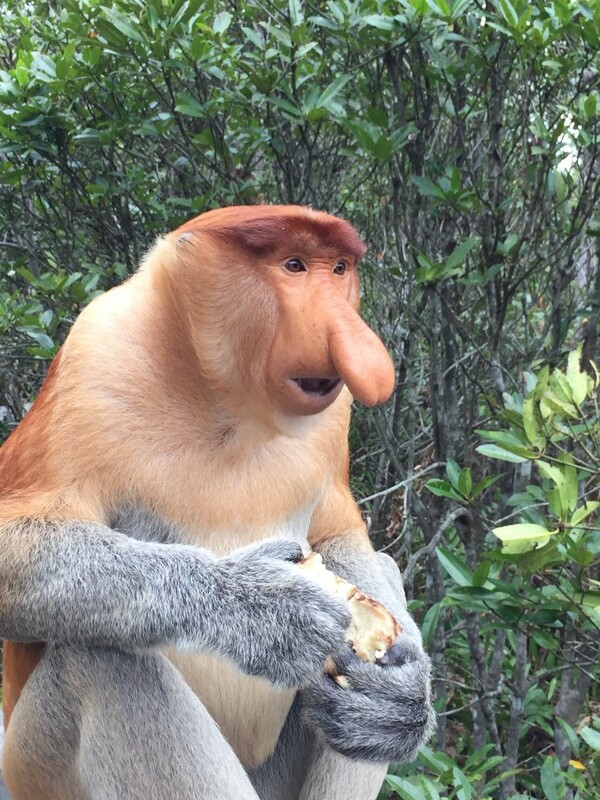 A 45 minute drive from Sepilok is the Labuk Bay Proboscis Monkey Sanctuary and boy are they some wacky primates. 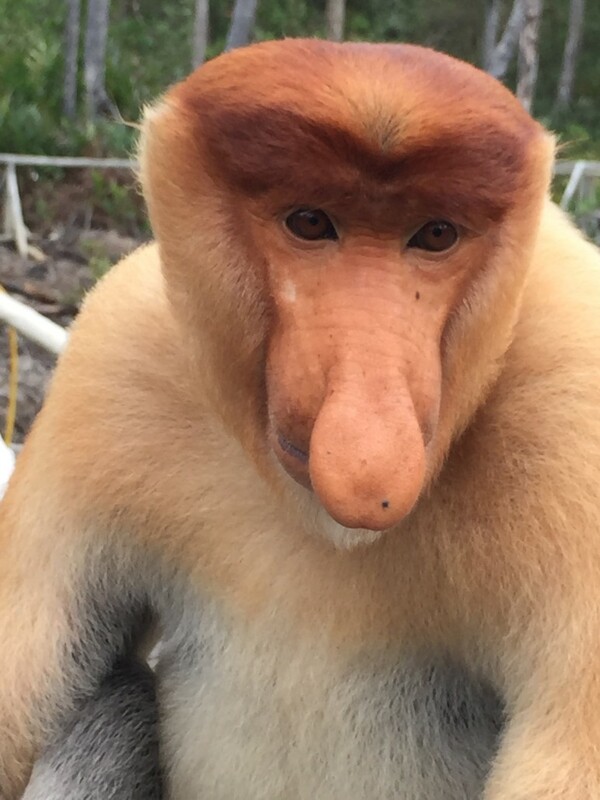 Found only in Borneo, proboscis monkeys also go by the Malay name orang belanda, meaning ‘Dutchman’, as Indonesians noted that Dutch colonisers often had a similarly large stomach and hooter. Their large nose is certainly comical and their fur is extraordinarily colourful – an orangey-pink face, red-brown body and grey arms and legs – but it was both their excitably exuberant and calmly relaxed antics that made me laugh until I cried. Do you mind, I’m having my lunch. Just like the orangutans, there are feeding platforms in the middle of the mangroves and when we arrived there were only two other people there and no monkeys in sight. 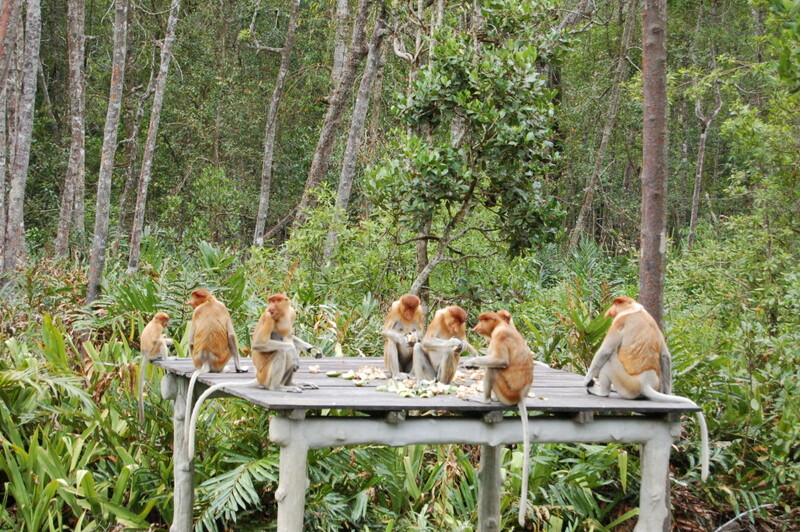 Then suddenly we heard trees rustling loudly all around us and within minutes there were more than forty proboscis monkeys hanging and swinging in the trees waiting for their feed. However, some were more impatient than others and decided to take a short cut. Right through the middle of the viewing area. And they didn’t just stroll through – they stormed through bashing their hands and feet loudly on the wooden slats. What was even funnier was Jasmine’s face. She was too petrified to laugh, while I was buckling over. They just looked so earnest in their quest to get to the other side. When the ranger laid out the food – fruit and a sort of pancake thing – the Jimmy Durante lookalikes went (even more) bonkers. There was more thumping on the boardwalks and even a few all-in brawls. This was all accompanied by incredible noises – honks, squeaks, roars and snarls. Their table manners were atrocious. They did all eventually calm down and sat where they liked to eat their food. A girl of about ten walked right up to one and put here face next to the monkey’s face and took a selfie. I stood mesmerised watching one that looked just like an old man eating (albeit one with a very large nose) while Jasmine stood by in shock when a rampaging monkey almost bowled her over. Oh, they would make for one crazy pet! But gee would they be funny. Thrills and spills in Borneo. Brian and Jasmine. Who will be the sole survivor?